Ford has used the same recipe for the Mustang ever since it rolled off the production line in 1964. Affordability, simplicity and handsome design has kept the original pony car in constant production over the past half century. 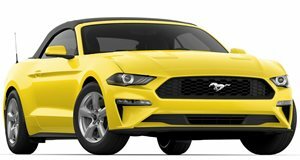 With the latest generation, Ford decided it was time to share the Mustang with the rest of the world, bringing it to Europe and, to Britain’s delight, building a right-hand drive model. The majority of Stangs sold in the UK will sport the V8 manual setup, which is the exact combination I spent a memorable long weekend with. 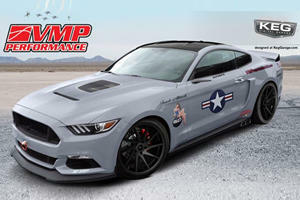 The 5.0-liter Coyote is at the heart of every Mustang, both literally and figuratively; the V8, offering 420 hp and 400 lb-ft of torque, burbles into life at the push of the start button and new cylinder heads has made the engine eager to chase the redline all the way to its 7,000 rpm limit. I also opted for the Convertible. Because, well, I’m English and despite of (or is it a flip of the bird to?) the perennial precipitation, us Brits love a good drop top. The new electric top is a big step up from the outgoing hydraulic system, providing superb insulation from the elements; outside noise is kept at bay and the black cloth sits nice and flush when raised. Ford’s Sync 2 eight-inch touchscreen isn’t the most intuitive, but a few days in the Ford Focus Black Edition a week beforehand meant I was already au fait with the sat-nav and entertainment features. This particular GT rolled off Ford’s Flat Rock plant, in Michigan, with an optional Oxford White paint job, which contrasts beautifully with the black 19-inch multi-spoke alloys and black cloth roof, as well a Shaker Pro premium sound system and climate controlled seats. It didn’t take long for the Stang and I to become friends, making the hard(ish) ride and occasional deflections easy to forgive. We went to the Festival of Speed, where the white horse spent her days surrounded by the British elite in Goodwood’s performance car park. And the Stang was my perfect companion for a cruise around London taking in the capital’s landmarks on a lazy Sunday morning. Testing its 0-60 mph time (around the 4.7-second mark), driving with the hood down in the rain, and dropping it from third to second purely to cheer up a rout of schoolboys skulking at a bus stop, enjoying this car was all too easy. The long power-dome hood is impossible but glorious to look over. It has buckets of personality and serious road presence; drivers happily gave way, while sidewalkers doffed their caps and pointed with glee whenever I rumbled by. Perhaps this wouldn’t be as acutely felt had we been driving on US roads, but across the pond they absolutely loved it. The Brits have well and truly fallen for the Mustang and within minutes of getting behind the wheel, I too had been charmed by the American brute. Make no mistake, even with the much-lauded independent rear axle, and not forgetting the fully independent front suspension, the 2016 Mustang is still a simple beast. But what it lacks in sophistication, is comfortably compensated by its cool factor. From every angle, the Mustang oozes style. And that 420-hp V8 sparking into life with a gentle press of the push-start never, ever, gets tiring. At this point it is worth applauding Ford for giving buyers the option of a four-cylinder EcoBoost, but for Brits wanting to live the American dream, it has to be the V8. Just get ready to burn through a fiver for every 18 miles of driving. Translation: I averaged just under 18 mpg after clocking over 300 miles spread evenly enough over city and highway driving. The superb six-speed manual is perfectly married to a deep clutch action. Gear changes require a strong left foot kick down followed by a satisfying left hand Bruce Lee style one-inch punch. But never once did I come to blows with the Stang. Yes, it’s too wide to fit in a British parking bay, and its considerable bulk and lack of precision steering made passing an articulated lorry in the opposite direction of a narrow leafy lane a lesson in keeping calm, and carrying on. Unlike, say, the McLaren 570S that goes exactly, and I mean exactly, where you want, when you want. But you don’t buy a Mustang if you’re in the market for a precision instrument. A week prior to driving the Mustang GT, I was at Spa Francorchamps, driving the E92 BMW M3, Porsche Cayman S and 911 GT3 around the fabled circuit. From a technical perspective, the German sports cars were on another level to the Stang, and testing myself on one of the most challenging tracks in the world was an unbelievable thrill. But if time with these Teutons was like being enlightened by a deep metaphysical discussion with an academic friend, the Mustang was my extrovert buddy, constantly cracking jokes and only interested in having a good time. 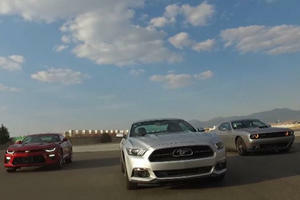 In short, the Mustang’s primary objective is to put a smile on its owner’s face. Can you put a price on being happy? Apparently you can, and it’s just under 38,500 GBP (40,330 tested). That is half the price of a fully loaded BMW M3. No wonder the Germans are snapping it up. After two months of top Chevy is once again second. 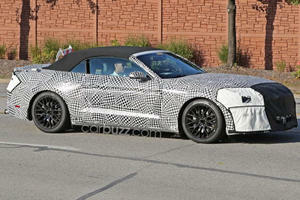 Will this car reverse the Mustang's recent sales slump?